Main Stone : Rose Quartz. Material : Gemstone. Main Stone Shape : As Seen In Picture. Length : Adjustable. Main Stone Color : Multi Color. Main Stone Creation : Natural. Metal: Sterling SilverStyle: CuffLength: Less than 7"
We will do our best to resolve any problem and to make you satisfied. We Deals in Jewellery Set. In any case, if you are not satisfied with. 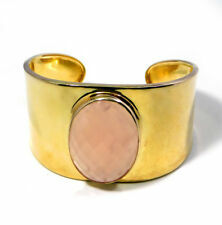 Style: CuffLength: 7 - 7.49"
MAIN_STONE : Rose Quartz. MATERIAL : Gemstone. STYLE : Cuff. Rose Quartz, Garnet Gemstone Handmade 925 Sterling Silver Cuff Bracelet Adst. Also, every piece of gemstone is thoroughly selected by our gemologists. Yes we gladly do! Q. (A) DO YOU RESIZE RINGS?. MAIN_STONE : Rose Quartz. STYLE : Cuff. MATERIAL : Gemstone. Alluring Rose Quartz Gemstone 925 Sterling Silver Cuff Bracelet Adst. Professional photographers take all jewelry photos. They use photo equipment, like Flash, Day Light and etc. Some of the colors of the stones might have effected a little. (Example: An amethyst stone is dark purple color, under the flash and lights it might affect the color a little and it shows little light purple instead of dark purple. )If you bring the jewelry outside under the sunshine you will see the same piece showing under the daylight. Please also note we have tried to keep the images as accurate as possible; however, there might be some color variations in the images published on our store and the real product due to light effects and photography. Balinese Hand Made Rose Quartz & Tsavorite Gemstones Tibetan Silver Cuff Bracelet. Gorgeous Rose Quartz with 2 green Tsavorite gem stones. A beautiful ethnic handmade bracelet. Bracelet is bendable/adjustable. MAIN_STONE : Rose Quartz. STYLE : Cuff. We will behappy to resolve any issues you may have in a cordial and friendly manner. MAIN_STONE : Rose Quartz Rough. MATERIAL : Gemstone. New ListingAmazing Rose Quartz Gemstone 925 Sterling Silver Cuff Bracelet Adst. SECONDARY_STONE : Carnelian. MAIN_STONE : Rose Quartz. STYLE : Cuff. OCCASION : Party. MAIN_STONE : Rose Quartz Rough. SECONDARY_STONE : Milky Opal. MATERIAL : Gemstone. MAIN_STONE : Rose Quartz. MATERIAL : Gemstone. Gorgeous Rose Quartz Gemstone 925 Sterling Silver Cuff Bracelet Adst. Beautiful Rose Quartz Gemstone 925 Sterling Silver Cuff Bracelet Adst. DaVinci Designer Jewellery Designs Modern and Artistc Top Grade Gemstone Jewellery Hand Forged by Silver Smiths. On Sale Sterling Silver Rough Natural Gemstone Cuff Bracelet 925 Solid Sterling Silver, high Polished anti tarnish finish. New ListingExclusive Rose Quartz Ethnic Style 925 Sterling Silver Cuff Bracelet Adst. Professional photographers take all jewelry photos. New ListingEntrancing Rose Quartz Ethnic Style 925 Sterling Silver Cuff Bracelet Adst. Splendid Rose Quartz Gemstone 925 Sterling Silver Cuff Bracelet Adst. Lovely Rose Quartz Gemstone Ethnic Style 925 Sterling Silver Cuff Bracelet Adst. Excellent Rose Quartz Ethnic Style 925 Sterling Silver Cuff Bracelet Adst. Gorgeous Rose Quartz Ethnic Style 925 Sterling Silver Cuff Bracelet Adst.